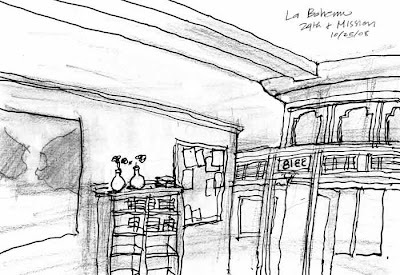 A quick sketch while sipping coffee in a San Francisco coffee shop: La Boheme in the Mission district at 24th Avenue and Mission Street. It’s an old cafe that’s been there forever. Sketching alongside a new artist friend of mine named Rick King. As an experiment, I took along my old fashioned crow quill pen and bottle of India ink. I seemed to have liked the results. I’ll have to do it more often. There’s nothing that has more richness then an old San Francisco cafe I came to realize. It’s a great stress reliever too which I’ve been experiencing a lot of lately.